Special Guest: Janice LaMoree—daughter of J. Marion Wright, the attorney who represented the doctors in the court decision—will speak about her father presenting the case in Washington D.C. 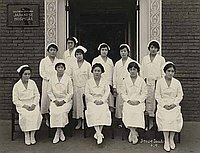 Arrive early to view slideshow of historic photos from the hospitals and Little Tokyo community. Reservations are recommended to rsvp@janm.org or 213.625.0414 at least 48 hours prior to the event.